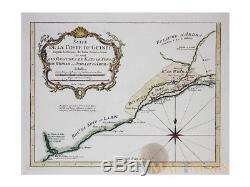 Africa Slave Coast Suite de la Coste by Bellin map 1747. Title: Suite de la Coste de Guinee Depuis la Riviere de Volta Jusqu'a Jakin ou sont Les Royaumes de Koto, de Popo, de Whidah ou Juida, et d'Ardra. 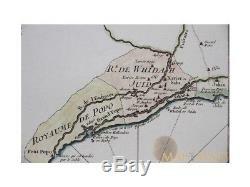 Description: Africa old map of the Guinea slave cost with Kingdoms of Koto, Popo, Whidah, and Ardra. The map is copperplate engraved with hand coloring and a decorative title cartouche and windrose. Publisher: Jacques Nicolas Bellin (1703 21 March 1772). (Royal Hydrographer, engineer of the French Navy and member of the Royal Society). ORIGINAL ANTIQUE COPPER PLATE ENGRAVING With fine hand coloring. Engraving is Absolutely Guaranteed authentic original map. A Certificate of Authenticity will be on request forwarded for each individual map or print. 37.5 x 24.5 cm. 14.75 x 9.5 inches. 10.75 x 8.25 inches. For better quality pictures please go to our web site. All maps and prints are genuine, authentic, published at the date stated above. 3 day's Global Express Courier Services on request. 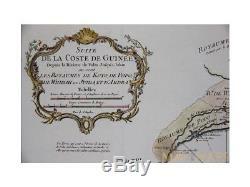 The item "Africa Slave Coast Suite de la Coste by Bellin map 1747" is in sale since Sunday, August 12, 2018. This item is in the category "Antiques\Maps, Atlases & Globes\Africa Maps". The seller is "mapandmaps" and is located in Europe. This item can be shipped worldwide.